Cross and Cutlass: Longing for His appearing? I'm always amazed when I meet "Christians" who aren't really excited about the return of Jesus. They don't think about it, don't plan for it, don't meditate on Eschatology Scriptures, don't read the signs of the times. They are just too caught up their current lives, in planning their futures. They concern themselves with education, getting a job, buying a house, vacations, cars, getting married, having kids, raising kids, grandchildren, what's on TV...etc. NONE of those things are wrong in themselves. They are all good things God has given us to enjoy in this world. And we have to do some of them to survive. But the question is, are they our entire focus? Do we shove God into a little 15 minute devotional in the morning and an hour service on Sunday? Are we LONGING for Jesus's Appearance? Or is a part of us hoping He doesn't come back for awhile so we can live our lives? What is the first thought that comes into your mind when you wake up? Is it.."Today could be the day I meet my Savior" or is it what you're going to have for breakfast, or all the tasks you have to complete that day, or problems with kids, friends, etc... just pouring into your mind like a waterfall. I recently heard a pastor say that every morning as soon as his mind wakes and all those problems and tasks start flooding in, he shuts them off and lays in beds and focuses on God. He thanks the Father for a new day and then asks if there's anyone he can pray for right then. Then he gives the day to God and asks God to use him that day to bring Him glory. I'm going to try to do this from now on. Because, one thing I believe with all my heart is this: We are NOT put on this earth to please ourselves. We are put here to bring glory to God. That's it. Pure and simple. 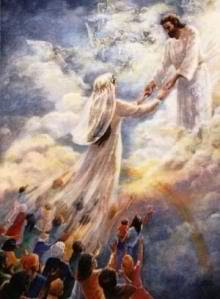 When we get to Heaven, we won't give a rat's behind whether our laundry is done or we got that promotion at work or how much savings we have in retirement or if that man broke our heart. We won't care if our house is clean or our yard mowed or whether we can afford a new car. In fact, I believe what most of us will be thinking is this: Why did I waste so much time on unimportant things?? Why didn't I spend more time with God? Learning about Him, listening to Him and following Him? Jesus spoke often about this Himself. He told many parables about being on the alert for the Master's return, about keeping oil in your lantern (a symbol of the Holy Spirit), of using your talents for God's glory, of being a good steward of your Master's belongings because you never knew when He would return. Is Jesus coming back soon? I happen to think so. Whether or not you agree is irrelevant. He could come back for you today, this minute, in fact. Our lives are like grass, here one day, and gone tomorrow. So are you longing for His appearance? Absolutely ... I am more than looking forward to the Lord's return/reappearing !!! I hear what you are saying though ... it is SO easy to become 'entangled' with the -- cares/woes/problems/material possessions, etc, in everday life. Then, giving the Lord the 'leftovers' -- that quick 15 minutes or so in a devotional time. I also believe it won't be much longer before He returns. I have found and learned, that nothing 'here' can satisfy as He does. Looking SO forward to that glorious day !!! Thanks again for another 'timely Word in due season'. Beautiful thoughts,MaryLu. I am with you completely. We are sooo running out of time. I love to read the news stories in RaptureReady.com. Things are falling into place. The labor pangs are getting closer together and more obvious such as the alliances between nations and against nations, Jerusalem always in the news, and last week, four volcanoes erupting at the same time in Russia. We really need to "be about our Father's business," whatever He has called us to do, if we want to see His hand in our lives, John 14:21. And, wow, isn't it great to know the Creator of the Universe loves us and is on His followers' side! Yes, indeed, Brenda.. there is nothing here on earth that can truly satisfy. I'm just sorry it takes so many of us years to discover that. Myself included. I hate seeing young people waste time on things that don't matter.. thinking they will make them happy. Yet…I just love that! There is so much truth in that little word. Christ will return one day. It may be because He calls us home, or it may because He returns! I think I have mentioned before, but I am Amillennial, so I don’t believe in the rapture. 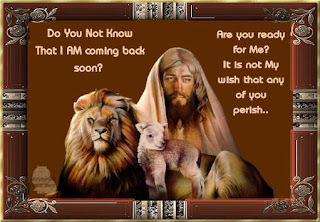 I fully believe that Christ could return at any moment or it may not be for along time yet. I believe that what is holding Him back is his love and mercy for the world and the souls of the unsaved. But, as Scripture says, we must always be looking ahead for that moment. It's very hard to do, Chaplain, when you live with others.. or have dogs or cats! But I'm trying to do that too.. Otherwise my head gets clogged with the day's responsibilities. Yes, Emma, I remember you are a Amillenialist! I think it's cool. I like having different viewpoints on my blog. Makes for interesting perspectives. I, too, believe that what's holding Jesus back is His love for the Lost... and His longing for them to turn His way.